A Travel Butlers safari and beach holiday really is the best of both worlds. It’s like having 2 amazing holidays in Africa rolled into one. 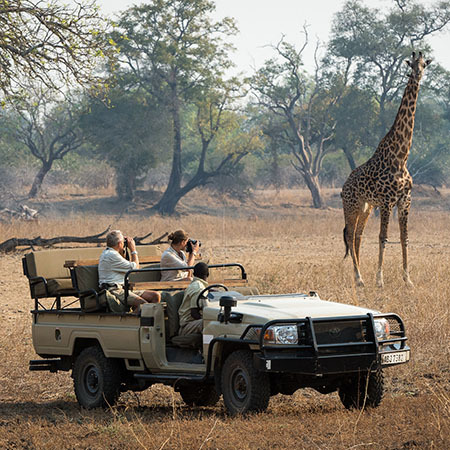 First, you’ll spend your days waking up to the sounds of the African bush, taking exhilarating game drives over the plains to spot Big 5 animals in their natural environment. Then, you’ll head to a tropical beach worthy of any postcard to totally unwind and reflect on your wildlife experience. It’s the perfect holiday, offering a wonderful mix of adventure and relaxation. © Robin Pope SafarisWe usually recommend doing the safari part of your holiday first and ending your trip on the beach. This will give a real sense of balance to your safari experience. Safaris can be pretty tiring because the game drives depart at the crack of dawn when the wildlife is at its most active. Your friendly wake up call can be as early as 5am, so it’s far from lie-in territory, but watching the sun come up over the savanna while you’re tracking lions, leopards and elephants will make the early start more than worth it! However, after a series of heart-thumping game drives, you’ll probably be ready for some serious down time and an exotic beach overlooking the Indian Ocean is the perfect way to get it! This means that you’ll arrive home relaxed rather than frazzled and ready to get back to reality again. A classic 7 night holiday would usually be a mix of 3 nights on safari and 4 nights on the beach. If you’re looking for a 10 night holiday, this could combine 4 nights on safari with 6 nights at the beach, or if soaking up some tropical sunshine is important to you, 3 nights on safari and 7 nights on the beach would do the trick. If you have longer than 3 or 4 night to spend on safari then most people would combine 2 different wildlife destinations, to give them a greater variety of experiences. When you’re planning your safari and beach holiday, it makes sense to choose destinations that are relatively close together. This will cut down both the time and money spent on travel during your holiday. You will also want to make sure that you have an idea of what the weather will be like at your chosen beach destination, so you may take a look at our guide to when to visit Africa's best beaches. A safari in Kruger National Park in South Africa, for example, works really well with the castaway beaches of Mozambique or if you are looking for somewhere with a buzz, then Mauritius would be the ideal choice. Similarly, a safari in Tanzania combines brilliantly with one of the luxury beach resorts on Zanzibar, a true island paradise. If you’re heading to Kenya on your safari holiday, you don’t need to travel anywhere else to find beautiful beaches, as Kenya has a stunning coastline all of its own. This means that you won’t incur any additional visa costs by travelling between countries during your trip. We’ve listed some of our favourite safari and beach combinations below, which we hope will give you some inspiration for your own trip. If you would like to use one of these as a starting point for creating your own unique Travel Butlers holiday or if would just like to discuss some initial ideas, simply complete the enquiry form or give one of our friendly experts a call on 01932 428380. There really is nothing like wrapping up a Big 5 safari with a few days on the beach, and combining a South African wildlife adventure with a relaxed beach retreat on the island of Mauritius will give you an unbeatable blend of excitement and relaxation. We can't recommend it highly enough! If you're looking a really memorable holiday, a South African safari topped off with a trip to the tropical beaches of Mozambique is exotic in the extreme. By combining these 2 destinations, you'll get a magnificent mix of animal adventure and laid back island life. Tanzania's Northern Safari Circuit is the place of safari and beach dreams - vast plains stretching into a hazy horizon dotted with wildlife coupled with soft, white sands laced with coconut palms. Add to this the possibility of also witnessing the Great Migration crossing the Serengeti Plains depending on when you are holidaying here, and this really is Africa at its most epic. Blending the world’s most spectacular wildlife with the planet’s most perfect beaches, a trip to Kenya and Seychelles is twin-centre supreme. First, you’ll race across the Masai Mara at sunset, scouring the savanna for herds of elephant and playful lion cubs. Then, fly directly to Seychelles for a dreamy dose of tropical sunshine. Kenya...phenomenal wildlife, tropical palm-fringed white sandy beaches and timeless ethnic tribal cultures. A country offering a holiday full of highlights and unforgettable memories from start to end.